Rabbit Stew: Hunter/Blogger: How to Explain Hunting to a Supermarket Shopper? Hunter/Blogger: How to Explain Hunting to a Supermarket Shopper? 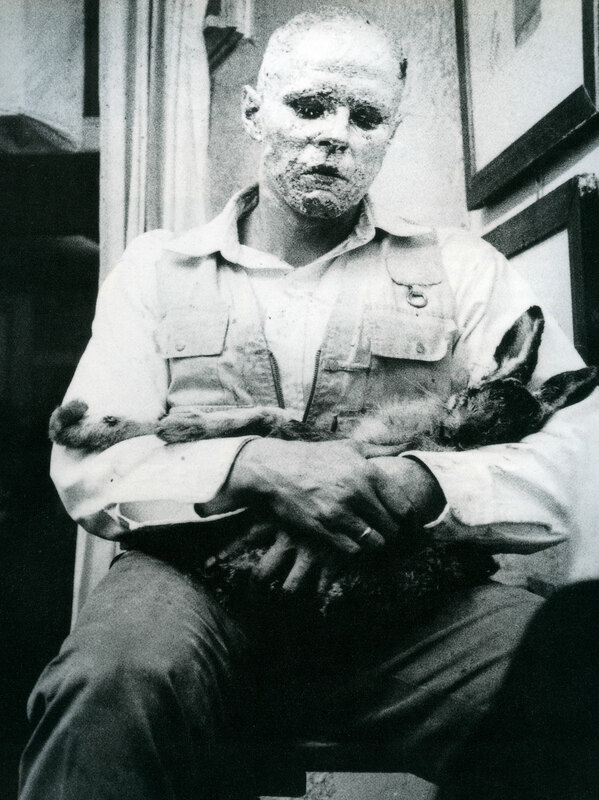 Here's a picture of the artist Joseph Beuys in a performance piece entitled: How to Explain Paintings to a Dead Hare. I've wanted to post this image here for a long time but I couldn't think of a good reason for doing so. Hunters would - I'd guess - probably not see themselves as having much in common with performance artists. These days, myself, it's getting harder for me to see the difference. I'm sure that Beuys thought of himself as having a duty with respect to the gaze of the public and to the political realities of the land in which he lived. Beuys was a long way from being a 'chocolate box' artist; he didn't set out to merely provide a succession of images that would please the eye. In a way, I'd say, hunters now find themselves facing the gaze of the public in a similar way; they face the a demand to keep providing acceptable images of how hunting can fit into the tidy world of appearances. But it really doesn't fit that well; there's life here: the reality of what it takes to put food on the plate and this does challenge people - they sometimes respond to this challenge with hostility. It'd be a mistake to use the visceral nature of hunting as something to throw in peoples faces for shock value. But it's also a mistake, surely, to try and sanitise it - to try and make it look like a pursuit that's fit for the cover of a chocolate box? Amen - it is absolutely a mistake to sanitize hunting. Nice post. Do you think the fact you live in (one of)the most urbanized cultures on earth has something to do with it? Up here hunting images are pretty much as matter of fact as going to the grocery. Not at all unusual to see animals being dressed in yards or even on the roadway during hunting season. Not just rabbits but moose and caribou. What makes me cringe is a visit to the meat packing plant where food's origins as critters is disguised to the point people on some level don't realize it.